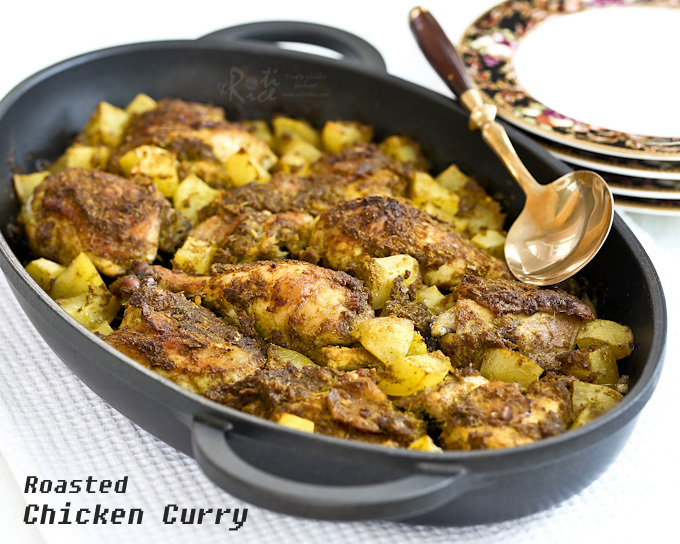 This dry style Roasted Chicken Curry is much easier to prepare than the stove top version. Simply combined all ingredients and roast it to perfection. It was one of those days when time just ran away from me. I had planned on making the traditional Chicken Curry for dinner. The chicken was thawed and chopped into pieces. The spices ground and ready. All I needed to do was to stand by the stove to cook but then I wanted to complete the project I was working on. Another hour on the project and I would be done. But what about dinner? That was when it occurred to me that I should perhaps stick it in the oven instead. That way I could finish my project and have dinner cooking at the same time. I turned on the oven, mixed the ingredients together, and place the dish in there. One and a half hours later, I was rewarded with this fragrant Roasted Chicken Curry. When I was done with my project, I quickly cooked some rice and prepared the vegetables for another dish. It only took 30 minutes and dinner was ready to be served. Phew! No need to go get that rotisserie chicken. I wonder what Ro-Ri San would think of this dish. Blend shallots (or onion), garlic, and ginger with ¼ cup (60ml) water. Transfer to a bowl. Add curry and chili powder. Mix to form a paste. Place chicken pieces in a large bowl. Add 2/3 of the spice paste. Stir to coat chicken. Combine remaining 1/3 spice paste with potatoes. Stir to coat. Transfer chicken and potatoes to a shallow baking dish. Drizzle vegetable oil over the chicken and potatoes. Roast in the oven for 1 hour 15 minutes to 1 hour 30 minutes until chicken is fully cooked. Remove and serve immediately with steamed basmati rice. The verdict was a thumbs up…YAY! A new way of preparing chicken curry was “born” in our household. I have since cooked this Roasted Chicken Curry several times for the boys when they came home for the holidays. They loved it! What more can I say? Give it a try! Now, Linda, that’s what I call a great brainwave! I have never thought of that and guess what, I shall definitely make this very soon. In fact, I shall make two different types at the same time – one extra spicy for the grown ups and one mild version for the kids! Fantastic idea! 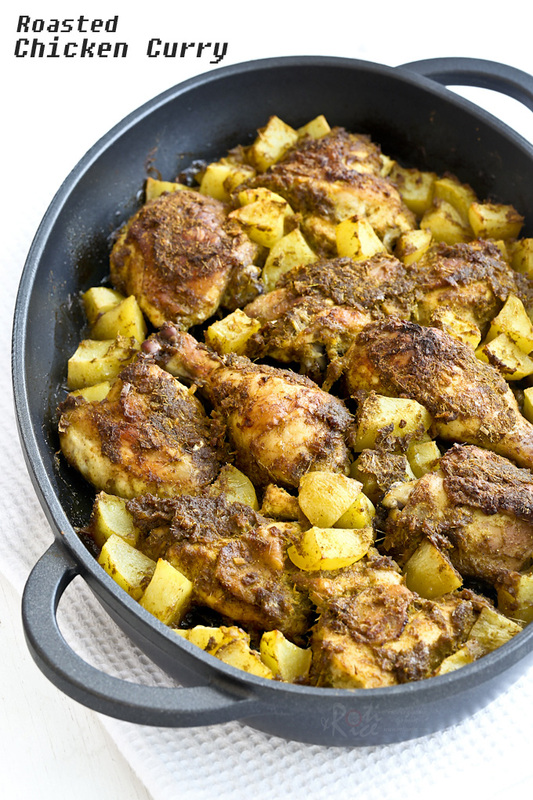 Whats’ the vegetable dishes that you cooked to pair with this chicken curry main dish? 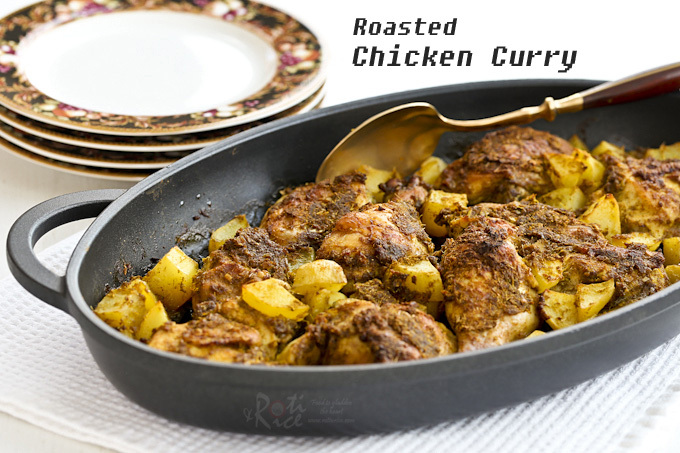 I would serve this Roasted Chicken Curry with any quick pickled vegetables or raita. Do check out my Cucumber, Tomato, and Boondi Raita recipe. I made this and added broccoli to the baking dish, and it turned out delicious. A nice, strong curry taste. Thank you! Glad the recipe turned out well for you. Adding the broccoli made it into a one pan dish. Pretty nifty!